Not a lot has been happening of late so no real updates to give. The Shed is mostly done and waiting on the final touches, just been short of cash so have not been able to get them. Car Registration and Insurance is due early next month and that plus the usual pair of tyres to pass safety checks usually cost me around $1000 so I’ve been saving up for that. Probably be another month before I get back to finishing the Shed. I have been doing a lot of work on the web server machine and the temporary file backup server since the big Raid storage crash. 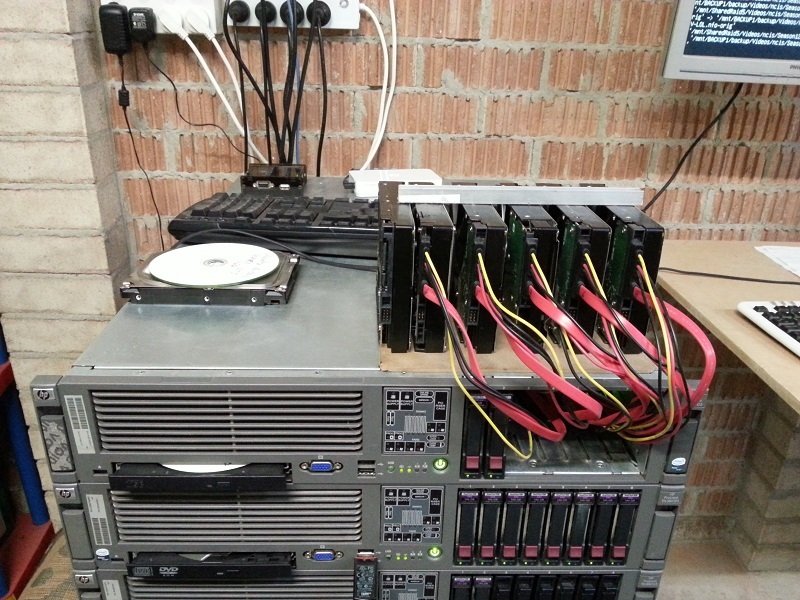 I have another matching server machine I’ve configured up and have rebuilt a new Raid array as the new storage drive. This time its a Raid 6 array using 5 drives initially which I’ll expand to 6 drives as I get them. As said in the last post, it’s going to take a while to purchase 5-6 new raid-spec hard drives… Once this replacement machine is ready I’ll be moving all the websites I host over to it, along with all the other services it runs (Minecraft server, Tiny-Tiny-RSS server, Sickbeard, SabNZB server, rTorrent and a few other things) not a huge job but I need to do it right, the current server has a lot of issues and quirks that I really want to correct this time. Enough for now. Thanks for reading! I don’t know if anyone reads this blog of mine except googlebots and the like, but anyone who might would know I don’t post much. Anyone who knows me personally may or may not know why. I’m a very quiet person, I rarely say anything and pretty much never call anyone. This is not because I don’t like them and certainly not because I don’t care about them. Even my poor family rarely hear from me and whether or not they know it I do care a great deal about them. The reason is I never feel like I have anything good or interesting to say. For some reason I feel I need to have something REALLY important in order to tell anyone about it. Just how I am. Even making this post is a huge step out for me, I’m doing it because I’m starting to feel like I need to get myself out there more. I’m 42 and still working low-end jobs because I’m no good at talking myself up or “Selling” myself for exactly the same reasons. The other reason people don’t see me much is that most of my spare time is consumed in many little projects and that too is something I need to focus on, not the projects themselves but the number of them and their priorities. I basically have so many in my head right now that it causing issues in itself. Part of writing this post is to start getting myself to communicate better and more often, to get my project listed and managed into priorities, to track them and their progress better as well as show and record all the things I can do. Purely for myself and my own reasons but if anyone else gets something out of it then even better. So I’m going to attempt to make some lists of Projects I’m working on and also have completed over the recent time. I want to document their progress, make available where possible any hardware or software references as well. I’d like to see if there are any WordPress plugins that may provide some sort of Project Tracker or the like as well. Have to see what’s out there. Hardware camera and image processor for the telescope using an FPGA. Rebuild my home web-server that hosts this and other Blogs. Design and build Version 2 of my own 3D-Printer. Sort, clean and recode my large collection of videos/photos/music/e-books. Build a pergola onto this house – then build it into a “Qld room”. The Chook Cage & Coup. Versions 1 & 2 of a tracking telescope. Rebuilt the controlling hardware and software inside a “cheap” 40W CO2 Laser cutter. (still have more ideas in plan but it is working enough that I could leave it as is). Back end work for various WordPress Blogs and Forums for my partner and some of her groups. That will do for now. More will come later.